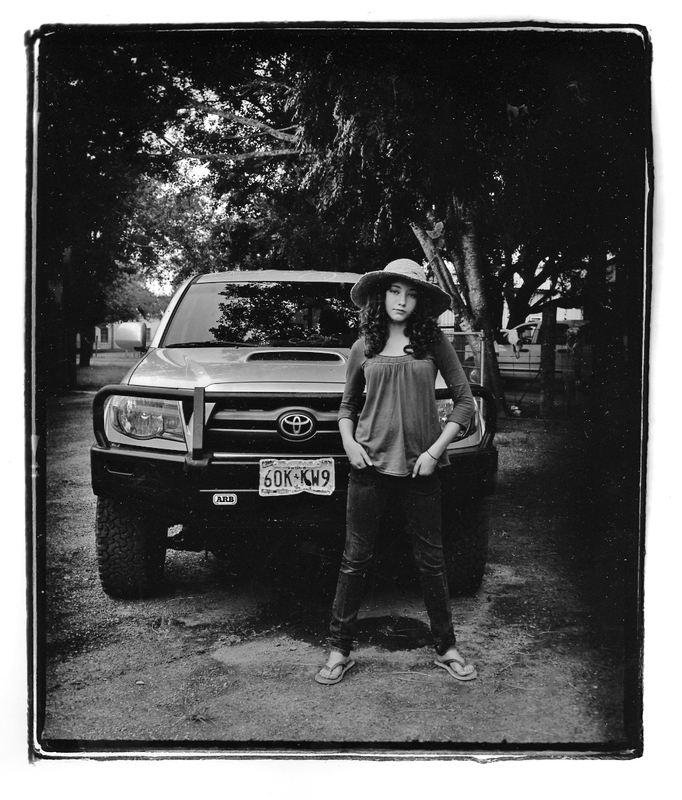 I photographed Rebecca next to Mike East’s Toyota Tacoma last year in July. Rebecca was 12. There seemed to be a child’s innocence in her pose and I thought the photograph was rather nice. Mike’s truck looked pretty good, too. This year (also in July) I photographed Rebecca by the truck. There were some obvious changes. One whole side of the truck was smashed and you might note that the license plate also suffered some modifications. The reason for this is that Mike East uses his truck to arrear (herd) cattle. He swings in an out, reverses and goes forward and plows through mesquite. This year he failed to move some 60 head from one pasture to another. I was so dizzy I thought I was going to lose my breakfast. It was my belief that Mike would return on another day to finish his task but he surprised me with, “Let’s try one more time.” He did succeed and then he asked, “Perhaps you are hungry so lets go to the camp cocina for some food.” I almost lost it right there! ﻿ When Rebecca posed for her picture I wanted to ask her to put on a dress. But I knew that her mother had allowed her to pack her suitcase so she had only brought shorts. Her pose is right out of some of those magazines that she looks at. She said she was imitating Daisy Duke from The Dukes of Hazzard and then took up the pose. This is one of the better ones. There is one where she poses inside the truck and on her side you can see Mike’s rattlesnake rifle. When Rebecca’s mother saw the picture she indicated to me that I was verboten to place that picture here. Still the change of one year is monumental. Unlike Mike’s license plate I do hope that Rebecca might straighten herself out a bit.